I’m so tired today. I’m just going to hang out here and have a little rest. This photo was taken in Honduras outside the Pico Bonito National Park. 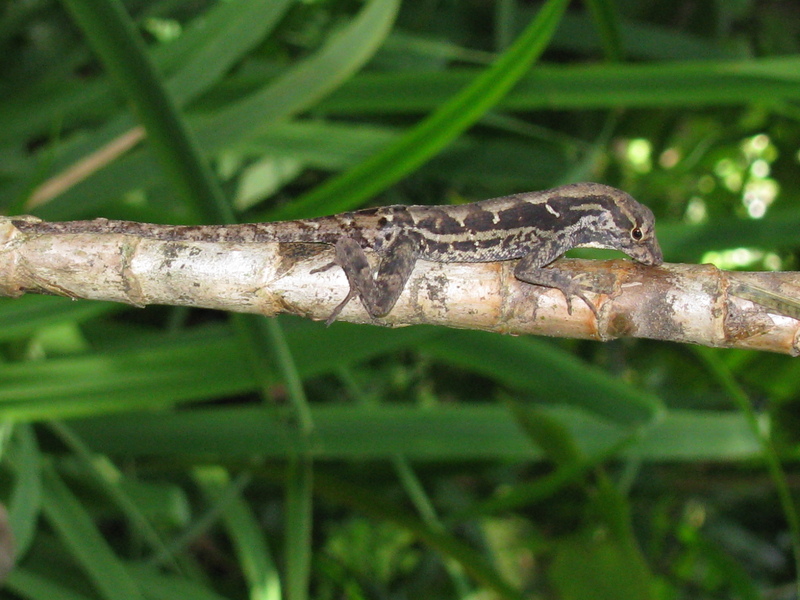 This entry was posted in Nature, Travel, Travel Photos and tagged Honduras, Lizard, Nature, Photography, Pico Bonito National Park, Travel Blog, Travel Journal, Travel Photo. Bookmark the permalink. That is great, it looks an awful lot like the way my dog sometimes lays on us. Weird how animals can look alike in their posture and mannerisms. Our dog does that as well. I find animals so expressive and they are fun to watch. Oh, he’s adorable!! He reminds me a little of my son’s leopard gecko. You did an excellent job getting that shot! Thanks! I thought he was so cute just relaxing. Cute! He is camouflaged very well, I might have had a hard time seeing it. It would have been a shame to miss this little guy. Thanks! I wish you a happy and relaxing weekend! I love this one. The bright green of the leaves is particularly effective. Thanks! I loved all the greenness in Honduras. Awww – how cute is he ??? If I looked at that photo quickly, I might actually miss the lizard… very nice. I wonder how many things and animals I didn’t see while I was there. Thanks for such a lovely comment! You’ve got quite a keen eye to spot this little guy amid all of those leaves and branches. He looks like he’s trying to go incognito. I don’t think he wanted to be disturbed so I snapped a photo and then left him alone. I was amazed by all the life in Honduras. All you had to do was look at one area and sure enough you find something amazing to see. Yes he does! Not a bad place for a nap.